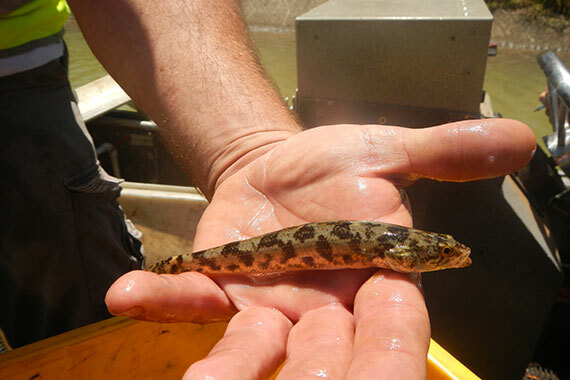 Native fish numbers and diversity in the Moorabool system have jumped significantly thanks to environmental watering, a 2015 monitoring project shows. The aims of the environmental watering program for the Moorabool River, west of Melbourne, include providing habitat diversity for galaxia, tupong and southern pygmy perch fish, while maintaining diverse macroinvertebrates and plants that rely on river flows. In 2015, we worked with the Corangamite Catchment Management Authority on an aquatic sampling project to get an accurate picture of the species living in the Moorabool. Saul Vermeeren, Environmental Water Coordinator with Corangamite Catchment Management Authority, said the project demonstrated the effectiveness of environmental watering. "Excitingly, project results demonstrated a strong increase in aquatic species population and diversity resulting from environmental flows and the 2010 floods," Saul said. "Six thousand individuals across nine native fish species were recorded in 2015, compared to 1,000 individuals across five species in 2008. The project results reflect positively on the watering program." During the 2014–15 financial year, 1,685 ML of environmental water was released to maintain water quality, fish habitat and vegetation in the Moorabool River during the hot and dry summer. "Low rainfall and catchment runoff over the course of the year reduced river baseflows, which also reduced environmental water volumes in Lal Lal Reservoir," Saul said. "Despite this, we were still able to implement three summer fresh events [small amounts of water that exceed the river's base flow] and a winter fresh to flush sediment, improve water quality and provide connectivity for migratory fish species."